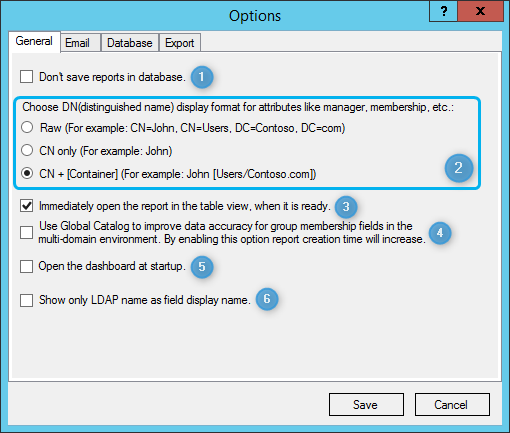 Turn off report saving in your local database. Leave currently generated reports intact, but don't save new reports. Raw - Turns off distinguished name display format, displays DN field types in their original look. CN only - Displays only common name part of a distinguished name. CN + [Container] - Displays both the common name part and the container of distinguished name. If ticked, it will open the report in the table view after the report generation is complete. If unticked, then the report generation progress form will remain and you will be able to choose what to do with results - open in the table view, export to file, send via email or close this form. Use Global Catalog to improve data accuracy for group membership fields in the multi-domain environment. If you enable this option, report creation time will increase. Opens the dashboard view when the program is started. If you prefer LDAP attribute names instead of Active Directory display names, you can easily switch.